Investing in precious metals may be one of the most important and smartest decisions you will ever make for your retirement plan. Precious metals, such as gold, silver and platinum, offer security that traditional dollars and cents lack. Look at the traditional financial markets today. Buying and selling stocks and ownership of companies is risky, especially with so much political and economic risk present. Yet, as a person who works hard, you may still want a way to put value aside so that you can save up for retirement. Precious metals are a better choice for this. Investing in precious metals offers numerous benefits. First, it protects against sudden or unexpected financial upheavals. The risks to other investments are numerous and include everything from natural disasters to the bankruptcies of large companies. Precious metals don’t have this same risk level and profits tend to be steady. In many ways, when you are buying gold and other precious metals you are purchasing a type of investment that is viewed as valuable no matter where you are in the world. The value doesn’t change based on political matters as much. Should You Invest in Mining? There is some risk involved in precious metals – like all types of financial investments. However, if you are investing in the mining sector, which is the process of investing in companies that mine, you’ll have a bit more risk than you may imagine. Investments in the New York Stock Exchange, or other global exchanges in which you are buying and selling stock in the mining sector, presents itself with various risks. This includes political risks, feasibility risks, and price risks. In short, these are the types of risks you’ll be able to minimize by turning to precious metals. So, what’s the solution? If you want to enjoy greater stability and less dependence on actually companies, invest in physical metals. You can elect to purchase actual gold, silver, platinum or other precious metals and hold onto these metals for your retirement investment. In short, you can purchase precious metals directly from a dealer. The funds go to a depository that is approved by the IRS. They are maintained there for as long as necessary. You pay a small fee for storage, and when you decide to retire you can pull the funds out – with interest accrued as the value of these metals rises naturally over time. Then, use the funds as you wish. You still benefit from retirement tax breaks, too. Ultimately, when you are considering your retirement you will need to think about security. The financial markets present risks to you as an investor. However, when you purchase physical gold and store it properly, you gain the advantages of a steady increase in value, less risk from political and economic factors, and improved long-term outcomes. It is always advisable to speak to your personal financial advisor on what’s right for your situation, but don’t overlook the value of this compelling investing opportunity. 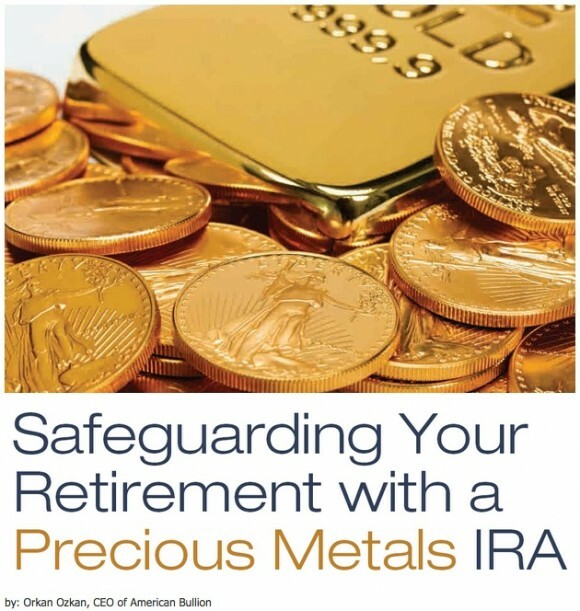 Call American Bullion today at 1-800-326-9598 to speak with a Gold IRA expert about converting your retirement account into physical gold and silver to help reducing your risk from Wall Street.